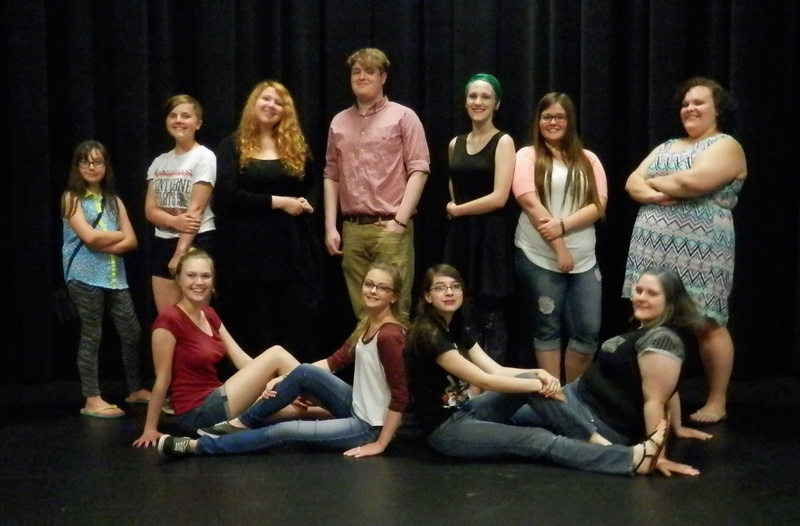 After three weeks of honing their acting and auditioning skills, several area youth will take the stage to showcase what they have learned in the acting and audition workshop, that was hosted at the Markay this month. The workshop was offered free to area youth through a grant from the Imagine Arts Endowment, which was facilitated by The University of Rio Grande. The workshop’s first week was under the direction of Candy Kaniecki from West End Studio in Los Angeles, California. The following weeks were under the direction of Minda Hager, Seth Argabright and Dr. Greg Miller. 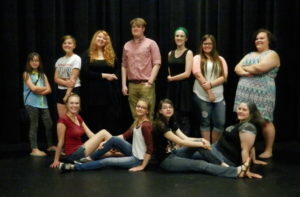 “The students have been researching and writing profiles, monologues, dialogues, and songs while learning some of the material made famous by various Jackson County natives who made significant careers in the arts,” explained Miller. He went on to say that the students have been exploring the historical films, musical and literary styles of prior generations of these prominent entertainers who called Jackson County home. Those former Jackson County natives are: Frank Cavett, Ben Ames Williams, Frank Crumit, Carl Summers, Isham Jones, Strickland Gillilan, The Edwards Sisters Quartet, and Brooks Jones. Miller explained that the students are preparing solos and monologues and will toss in a few surprises for the audience to enjoy. Small Town, Big Dreams will be presented on the Markay stage, on Thursday, June 23 at 7 p.m. Admission is free. Any donations will be gifted to the Markay Cultural Arts Center. Cast of “Small Town, Big Dreams”. First row, pictured from left, Kendra Perry, Emma Matthews, Savannah Crisp and Courtney Polcyn. Back row, pictured from left, Lilian Colley, Lillian Sizemore, Marah Hager, Derek McCarty, Emily Polcyn, KeAnn Wilson and Lindsey Polcyn. • Emma Mathews, 15, of Jackson, is the daughter of Tammy Byler and the grand daughter of Lynn Byler. She attends 10th grade at Jackson High School. Emma has performed in the following productions: Annie as Tessie; Into the Woods, as a member of the chorus; You Can’t Take it with You as Donald; and as Adella in The Little Mermaid. “It’s exciting to be involved in a program like this and to be working with so many other great actors and actresses,” Emma said of what it meant to her to have access to this workshop. Emma hopes to continue acting as a career, but if not, she wants to stay involved with productions. • Kendra Perry, 17, of Jackson, is the daughter of John Perry and Michelle Sanborn. She is a senior at Jackson High School. Kendra has performed in the following roles: Doris in Miracle on 34th Street; Grace in Annie; Dari in The Jungle Book; Cinderella in Into the Woods; Alice in You Can’t Take it with You; Ariel in The Little Mermaid, all productions by the JHS Drama Club; as well as the role of Emma in Emma at the RTG Theatre Guild. Kendra said that she always had a passion for acting and theatre, adding that there is always more to learn. “I wanted to take this workshop to stay involved and learn as much as a I can,” Kendra explained. Kendra hopes to major in performance in college and one day act professionally. • Emily Polcyn, 15, the daughter of Carol and Anthony Polcyn, attends the 10th grade at Jackson High School. Emily has had the following roles: Jetsam in the Little Mermaid; Kate in Annie, Gay Wellington in You Can’t Take it with You; Harriet in Emma; Alice in Alice in Wonderland Jr.; and in the chorus in Oliver. Emily hopes to hone her audition skills, cold reading skills and processes for understanding and developing a character. “This workshop is a great opportunity in a town where acting classes are hard to come by. It teaches me skills I can use as an actress in the future. Emily plans to attend college for musical theatre. Marah has held roles in That was Bob (waitress), Steel Magnolias (Shelby), Christmas with a Welsh Accent (ghost) and Emma! A pop musical (Emma). Marah took the workshop to gain more experience and to learn new techniques. She hoped to strengthen her overall acting, as well as be a better character and have better character interaction. • Courtney Polcyn, 16, the daughter of Carol and Anthony Polcyn, attends the 11th grade at Jackson High School. Courtney has played the following roles: Kaa in The Jungle Book; Florinda in Into the Woods; June Fairfax in Emma; The Duchess in You Can’t Take it with You; and The Queen of Hearts in Alice in Wonderland. “I attended the workshop to improve my acting skills and to gain confidence in public speaking,” Courtney said. She hoped to learn how to improve her cold reading, improve and audition skills, as well as how to analyze a script. “Even though I am not planning on acting as a career, I do plan to continue doing community theatre,” Courtney said of her future acting aspirations. • Savannah Crisp, 16, of Jackson, is the daughter of Crystal Crisp and Matt. She is a junior at Jackson High School. Her prior acting roles were in Annie, The Jungle Book as a wolf cub; and Cinderella’s Dead mother in Into the Woods. She also has had a role in the French Art Colony’s production of Emma!, A pop musical. “I hope to learn how to make a performance more real and how to get more in character,” Savannah explained as to why she attended the workshop. She plans to continue to participate in community theatre. • Derek McCarty, 16, is the son of Tammy and Roy McCarty of Oak Hill. Derek is a junior at Oak Hill High School. His previous acting roles include the Baker in Beauty and the Beast; the Mayor in the Wizard of Oz; Mike T.V. in Willy Wonka; Prince Eric in The Little Mermaid; Scar in The Lion King and is slated to be the Genie in Aladdin this upcoming school year. Derek took the workshop because he wanted to improve his acting skills. He explained that he hopes the workshop will help him become the character better. “It was an amazing experience to participate in this class,” Derek said. He hopes to eventually become a professional actor. • KeAnn Wilson, 16, of Oak Hill, the daughter of Nikiah Wolfe and John Wolfe. She attends the 11th grade at Oak Hill High School. Her previous acting roles were a Munchkin in the Wizard of Oz; an Oomph Loompa in Willy Wonka; Allana in The Little Mermaid, Rafiki in The Lion King and will be starring as Jasmine in the upcoming OHHS production of Aladdin. “I decided to take this acting workshop to learn more about acting and improve,” KeAnn said. “I hope to learn how to become a better actress,” she explained. KeAnn said it is her dream to become a professional actress. • Lindsey Polcyn, 18, of Jackson, is the daughter of Carol and Anthony Polcyn. Lindsey is a Freshman at Capital University. She has undertaken the following roles: Mrs. Armstrong in the Greatest Christmas Pageant Ever; sang in the chorus on Oklahoma; Judge Harper in Miracle on 34th St.; Miss Hannigan in Annie; Shere Khan in The Jungle Book; the Baker’s wife in Into the Woods; Grandma Vanderhoff in You Can’t Take it with You and was Ursula in The Little Mermaid. “I wanted to further hone my skills as an actress so I can have success in the Operatic Field that I am pursuing,” Lindsey said. “I hope to learn to trust myself as an actress and not rely on what I think the audience wants. I want to be the most genuine version of myself,” she said of what she hoped to learn during the workshop. “In an area like this, it is often difficult to have access to accelerated studies in the arts outside of high school. This allows those who are truly passionate to learn more about the basics of acting,” Lindsey said of how access to the workshop was important to her. Lindsey wants to pursue Opera performance in he future. ”I plan to travel around the world and perform,” she said. • Lillian Sizemore, 14, of Vinton County, is the daughter of Katie and Phil Sizemore. She will be in the 9th grade at Wellston High School in the Fall. Lillian’s past acting roles include Ariel in The Little Mermaid; Harriet in Emma! ; Celeste in an Ohio University student film Clairvoyant; Gracie in Songs for Myself; a musical; and was an extra in another Ohio University Student Film titled Doll. “I’ve already learned important lessons from this class and I hope to learn more,” Lillian said. “I hope to learn how to come out of my shell more and be less nervous I professional situations. I want to learn skills that will help me in a career,” Lillian explained as what she hoped to learn during the workshop. • Lilian Colley, 10, of Rio Grande. She is the daughter of Lucia Jones. She attends the fifth grade at Rio Grande Elementary. Lilian has acted the lead in four Ohio University Film School productions, and one supporting role. She has been in two films; Mother and When Skies are Gray, which was shown at International Film Festivals. She has also acted in several RTG plays and University of Rio Grande Theater. Lilian hopes to learn how to work better with other actors. Her future acting aspirations include working in film and television.